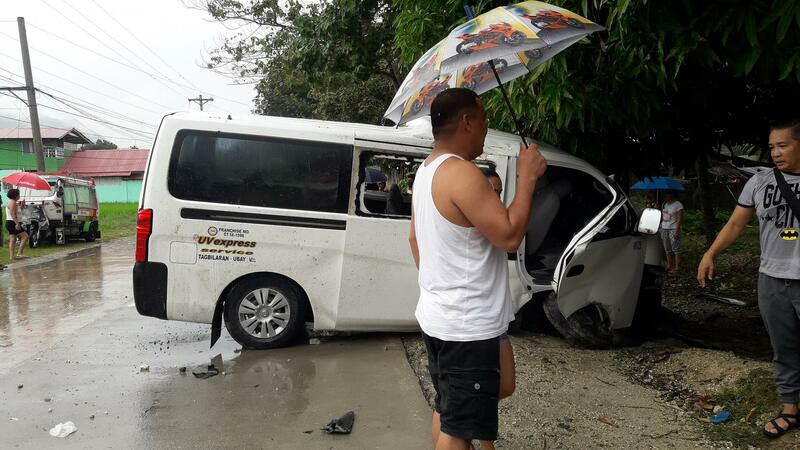 At least 10 individuals including a foreign national and two minors were injured after a van-for-hire figured in an accident in Garcia Hernandez on Sunday amid continuous rains in the province brought by Tropical Depression Amang. The vehicle slammed straight into a mango tree at the side of a national road in West Canayaon, Garcia Hernandez at 11:55 a.m. on Sunday, said PO2 Erwin Digal of the Garcia Police Station. The van’s driver, Kennet Simporias, a native of Sikatuna town, lost control of the vehicle while travelling towards Tagbilaran City from Ubay due to the slippery road. Police identified injured the passengers as Wenifredo Jimenez, 48, of Jagna; Efraim Jimenez, 15, of Jagna; Ryan Golosinda 26, of Guindulman; Mariel balicog, 19, of Alicia; Charles Albert Olavides, 18, of Balilihan; Jerson Olavidez, 14, of Candijay; Enemisio Dela Torre, 23, of Guindulman; Adam Mastrangiola 35, a foreign national; and Rose Boyuro, 26, of Alicia. According to Digal, the passengers and Semporias sustained minor injuries. Some have already been discharged from the hospital while others were still being treated. The Garcia Hernandez Police Station, meanwhile, reminded motorists to avoid speeding particularly on wet roads.